The RIKAB Institute is located near the basilic of Koekelberg in Ganshoren. Address: Prins Boudewijnstraat 71 (= 71 Rue Prince Baudouin), 1083 Ganshoren (Brussels), Belgium. Phone: +32-02-428 2013. Fax: +32-02-420 1324. GO HERE for maps of the area around the RIKAB Institute and a larger-scale map of Brussels with RIKAB indicated. GO HERE for underground, tram and bus maps (including walking directions from bus stop BRUSSELAARS and tram stop SPIEGEL). 1) Go to the train station on the lower level inside the Airport building. Take the train to BRUSSEL NOORD (GARE DU NORD). Trains leave every 20 minutes and the ride takes 15 minutes. The RIKAB has hosted the European Championship four times in a row (1994 through 1997). To get a flavour of what to expect, here are two pictures of the last championship that was held there. 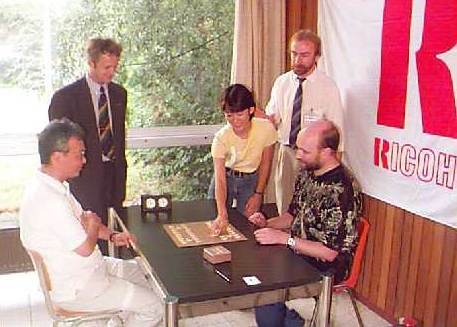 The first move of the first game of Steven Cain (sitting right) and European Champion Toyokazu Myamoto (sitting left) was made by charming female pro and guest star Yamato Takahashi. Chief arbiter Hans Secelle (standing right) is looking rather sceptical about this move while the representative of Ricoh Belgium (standing left) seems to approve. 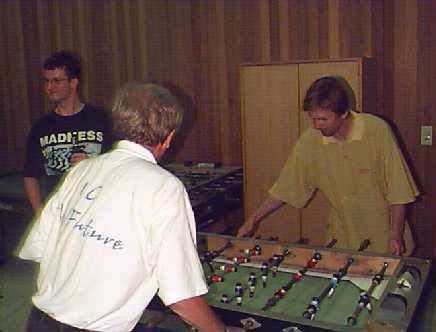 No, this is not an English pub, but the English delegates (from left to right: Steve Lamb, Les Blackstock and Tony Hosking) playing a game of tablesoccer and drinking beer.